ENEOS SUSTINA Enhanced Performance Synthetic Motor Oil is a premium, high performance fully synthetic motor oil formulated from JX Nippon Oil & Energy’s proprietary W BASE technology, producing extremely high VI (viscosity index) synthetic base oil that maintains a very stable oil viscosity over a wide temperature range. This technology allows ENEOS SUSTINA to remain very fluid at cold temperatures, reducing internal engine drag and improving fuel economy up to 2% compared to currently available fuel-conserving GF-4 and GF-5 oils of the same viscosity. 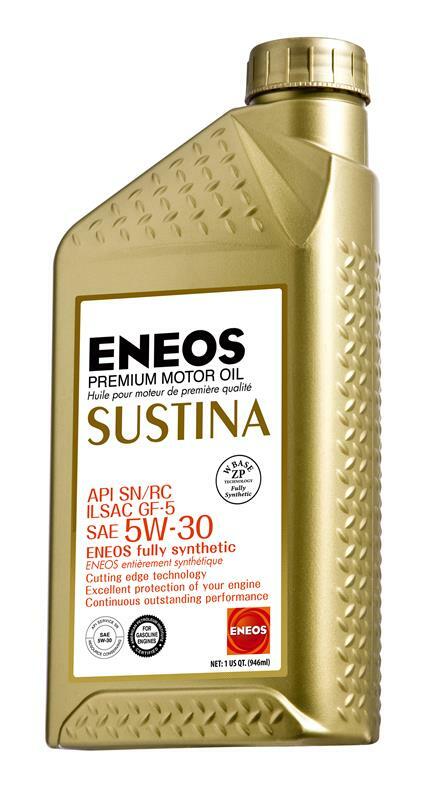 ENEOS SUSTINA also utilizes the sulfur-free characteristics of ZP additive chemistry, reducing the formation of detergent destroying sulfuric acid, keeping your engine cleaner and running longer.